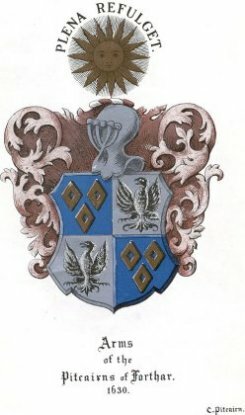 William Pitcairn, seventeenth lord of Pitcairn and Forthar, eldest son of David Pitcairn of that Ilk, succeeded to the estate of Forthar. On Jan 2, 1655, he was served heir to his father, David Pitcairn of that Ilk, in an annual rent of 500 merks forth of the Lands of Kincappill in the regality of St Andrews, equivalent to the yearly tax duty of 500 merks for the Teynds of the said lands of Kincappill, disponed by the said David Pitcairn to Sir John Spottiswood, sometime of Dairsey, Knight. David Pitcairn, the father of William, died before Nov 29, 1653: his son was served in a retour of inquest held in the Tollbooth of Cupar at that date, as nearest and lawful heir-general of his father. At Edinburgh, 11 Nov 1644, The King, with consent &c., had confirmed the Deed of David Pitcairn of that Ilk by which in fulfilment of the marriage-contract dated at Gilmrtoun, 15 April 1638, he granted to William Pitcairn, his lawful son, the lands and barony of Forthare (viz., the lands and dominical lands of Forthare, with the tower, manor place, the ill-lands of Dounefield, with the manor place, tenements &c., the mill of Freuchie-mylne with its lands &C) in the county of Fyfe. Reserving to the said William and his heirs-male to be born between him and Anne Creightoun, who is shortly to become his wife, lawful eldest daughter of Sir David Creichtoun of Lugtoun militis, whom failing, to the heirs-male to be born of the body of the said William, whom failing, to the said David Pitcairne and his heirs male whomsoever, whom all failing, to return to the King. William Pitcairn’s daughter Marion/Margaret underwent much persecution In 1677, upon the 7th of August, some ladies find by the Council. Margaret Rigg, Lady Pitlochie, Margaret Pitcairn, wife of Alexander Hamilton, Lady Kinkel, are cited for alleged being at conventicles, and when not compearing they are held as confessing, and the Lady Kinkel fined in five thousand merks and the other in a thousand, and letters are directed against them and their husbands, &c.
In 1650, William Pitcairn of Forthar sold to his uncle, John Pitcairn of Unstoun, the old estate of Pitcairn, which had been held by the Pitcairns of that Ilk for more than four hundred years.